The Martin Brother’s pottery was established at Pomona House, Fulham, London, in 1873, moving to Southall in 1877. Of the four Martin Brothers, Walter Fraser, Edwin, Charles and Robert Wallace, it is Robert who as the chief modeler and designer of the pottery is best known today. They made very distinctive stonewares and while the Martin Brother’s are perhaps best known for producing the grotesque or ‘Wally’ bird tobacco jars, and mugs and jugs decorated with grotesque faces, this formed only a relatively small part of their production. Pictured right – An imposing large Robert Wallace Martin stoneware bird jar dated 1882 black-painted wood socle, flange inscribed R. W. Martin, Sc./Southall Pottery, 2-11-1882, base inscribed R. W. Martin/London/& Southall/1882. height 25 1/2 in. (64.8 cm. )., from the Sotheby’s Harriman Judd Collection of British Art Pottery, New York in 2001 sold for $81,250. Initially, architectural works were produced for which Charles as business manager and developer was largely responsible. The vessels, large and small, the form often inspired by vegetables, can be incised with birds amongst grasses or birds perched in branches, or aquatic life, and were inspired by 18th century illustrations, executed in Japanese style. 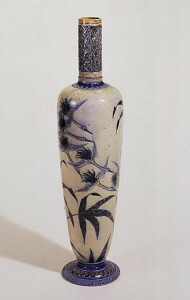 Pictured left – A Robert Wallace Martin monumental stoneware vase circa 1880 incised with birds and palm trees, (firing cracks at foot), impressed MARTIN. height 42 in. (1.07m. )., from the Sotheby’s Harriman Judd Collection of British Art Pottery, New York in 2001 sold for $7,200. A few wealthy or farsighted individuals who saw the individually expressive and original thought that had gone into the creation of the pieces largely bought the wares produced. The final firing of the Southall kiln was in 1914 with only a small percentage of the wares being successful, as had been the case in the last few firings. Pictured left –A Martin Brothers stoneware small double-sided face jug dated 1910 inscribed Martin Bros./London & Sout hall, 5-1910. height 5 1/4 in. (13.3 cm. ), from the Sotheby’s Harriman Judd Collection of British Art Pottery, New York in 2001 sold for $5,700. The majority of pieces made by the Martin Brothers at Southall bear the mark RW Martin & Brothers London & Southall along with a number and date. Pieces inscribed and attributed to Robert Wallace Martin himself tend to be the most valuable.